Over 20 years. Thousands of lawns. Some people assume landscape companies are all basically the same. But three key qualities set Clean Cut Lawn & Landscape apart from the pack, keeping our clients happy, year in and year out. We’re dependable. You don’t stay in business for over 20 years without a track record of reliability. Our commitment to being on time is unsurpassed. In fact, our long-time clients rarely bother to pick up the phone – they know we’ll be there when they need us. We know landscaping. We’re not just lawn jockeys, and we don’t provide cookie-cutter designs. We integrate every new landscape plan into the existing architectural surroundings for a visually seamless, aesthetically sound solution. We listen. Carefully. Our clients’ desires dictate everything we do. So we make sure we understand them fully before we set about doing any work. Listening – patiently, courteously and attentively – is the first crucial step of every new project we take on. For these reasons, residential and commercial clients depend on us for regular lawn maintenance, leave and snow removal, complete landscape makeovers, and more. 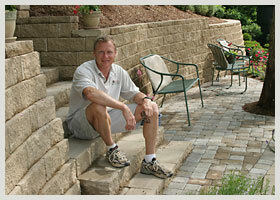 Find out how Clean Cut Lawn & Landscape can help make your lawn – and life – better. Call us today at (765) 759-8575.